We now know how to use population improvement through recurrent selection for Cuban rice. Between late 1996 and 2001, we worked with different populations, both introduced and created in the country. Moreover, population improvement, based on phenotypic recurrent selection, for resistance to blast and tolerance of cold temperatures has also been carried out. This chapter reports on how we acquired this knowledge and how we constructed these base populations. We also present some preliminary results of strategies for population improvement and line development, and indicate prospects and future work plans of the Cuban rice genetic improvement programme. Las bases para el empleo del mejoramiento poblacional a través de la selección recurrente en arroz en Cuba ya están disponibles. Desde la segunda mitad del año 1996 y hasta el 2001 se ha venido trabajando con las poblaciones introducidas y las creadas en el país. Además se ha realizado el mejoramiento poblacional con base en la selección recurrente fenotípica para resistencia a Piricularia y tolerancia a bajas temperaturas. El objetivo de este trabajo es reportar cómo se construyó esa base de conocimiento y las poblaciones, presentar algunos resultados preliminares de las estrategias de mejoramiento poblacional y de desarrollo de líneas, e indicar cuales son las perspectivas y el trabajo futuro para el programa de mejoramiento genético del arroz de Cuba. The rice genetic improvement programme (RGIP) of the Cuban Rice Research Institute began working in the area of population management at the same time as did other countries in Latin America, that is, in 1996. The foundations for establishing the programme lay in training its researchers in the methodology, and introducing and evaluating populations available at CIAT, Colombia. The first stage in managing these germplasm materials was to select, within the populations, those genes that would help increase the potential for yield and, at the same time, improve the grain quality of the materials being used by Cubas conventional genetic improvement programme. Populations PCT-4, PCT-7 and GPIRAT-10 were introduced in the second semester of 1996 and evaluated until early 2000, leading to the development of PIACuba-1 and PIACuba-2 (Pérez Polanco et al., 2000). The first is a product of introducing four Cuban varieties into GPIRAT-10, and the second resulted when PCT-4 was used as a base population to introduce five varieties grown in the country. All the evaluations carried out so far have sought to establish a solid structure on which to exploit the genetic resources of rice by working with population improvement. To achieve this, populations were established and experience gained to begin a routine procedure of recurrent selection built around the evaluation and selection of S0:2 families. In the first stages, phenotypic recurrent selection was carried out, using S0 plants. What was expected on evaluating and creating them with wide genetic bases was that they would possess combinations of favourable and new alleles for several of the traits regarded as priority by the RGIP. Consequently, in the near future, plant breeders would be able to better exploit these genetic resources and obtain recombinants that combine the above-mentioned traits. Initial studies sought to actively maintain the three introduced populations and understand their performance under Cuban conditions. Their maintenance was achieved through the continuous planting and harvesting of male-sterile plants. The programme also ensured that, for each generation, a minimum of 200 male-sterile plants were harvested, as recommended by Geraldi and Souza (2000), to prevent changes in the populations allelic frequencies. Population PIACuba-1 was obtained in the 1999 dry season, and PIACuba-2 in the rainy season of the same year, after determining the performance of the introduced populations and choosing those that had the most potential for the country. Since their development and until 2001, three cycles of recombination were carried out for PIACuba-1\0\0\3 and two for PIACuba-2\0\0\2. The procedure followed for both populations was similar to that discussed in the previous paragraph for the introduced populations, that is, planting and harvesting male-sterile plants. The goal of this strategy was to ensure that linkage blocks were broken and allelic recombinations favoured, as Hanson (1959) recommended. Figure 1. Distribution of frequencies for plant height in introduced rice populations PCT-4, PCT-7 and GPIRAT-10, and locally created populations PIACuba-1 and PIACuba-2. Evaluations were conducted at the Rice Experiment Station Sur del Jíbaro, Sancti Spíritus, Cuba, 2000. Parallel with this work of creating and maintaining populations, researchers trained in conventional genetic improvement took advantage of the genetic variability available in each segregating generation to select fertile S0 plants, incorporating them into the conventional programme to develop lines and produce commercial varieties. This chapter reports on the results obtained over the last 3 years from the search to establish the framework on which to exploit these genetic resources. Emphasis is given to population improvement through managing populations with wide genetic bases and to our experiences with developing lines from these populations. To firmly establish work in population improvement, we decided to morphologically characterize the new populations and compare them with the original or introduced ones. In 2000, at the Rice Experiment Station Sur del Jíbaro, Sancti Spíritus, all the populations (PCT-4, PCT-7, GPIRAT-10, PIACuba-1 and PIACuba-2) were planted, sampled and evaluations conducted for about 200 plants per population. The agronomic traits evaluated were plant height (cm), number of tillers per plant, panicle length (cm), grain length and reaction to diseases, principally neck blast and grain discoloration. Figure 2. Distribution of frequencies for number of tillers per plant in introduced rice populations PCT-4, PCT-7 and GPIRAT-10, and locally created populations PIACuba-1 and PIACuba-2. Evaluations were conducted at the Rice Experiment Station Sur del Jíbaro, Sancti Spíritus, Cuba, 2000. Figure 1 shows that the plants of the new populations presented a larger distribution of individuals in the classes with shorter heights than did the introduced. For example, when totalling the three classes below 71 cm, more than 45% of PIACuba-2 plants were shorter than 75 cm and only 1.5% were taller than 101 cm. This result reflects the strong influence of the varieties that were introduced into population PCT-4. 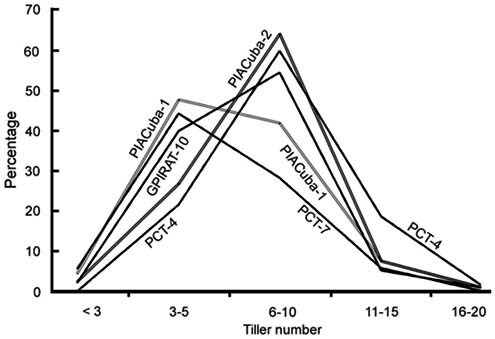 Similar findings could be observed when comparing populations PIACuba-1 and GPIRAT-10. The trait number of tillers indicated that, according to the distribution of data presented in Figure 2, PIACuba-1 and PIACuba-2 performed in a similar manner to the base populations used in their development. That is, most of the plants of PIACuba-1 and GPIRAT-10 had between 3 and 10 tillers, and PIACuba-2 and PCT-4 had between 6 and 10. Panicle length was another trait used to characterize the populations. 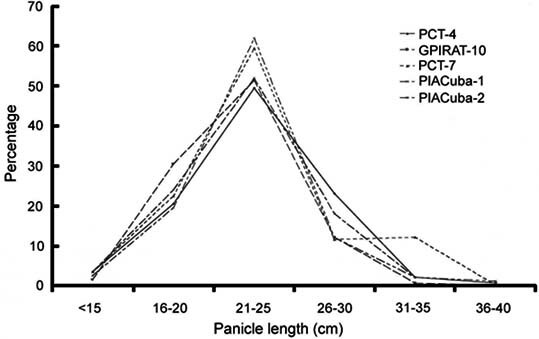 Figure 3 shows that all the populations had a similar performance, with most having panicles that were between 21 and 25 cm long. Of all the populations, PIACuba-1 more frequently had grains that were longer than those of its original population. A contrary effect was seen for PIACuba-2. However, all the populations evaluated presented had higher frequencies of grains longer than 8.0 mm, an acceptable size for the RGIP (Figure 4). Figure 3. 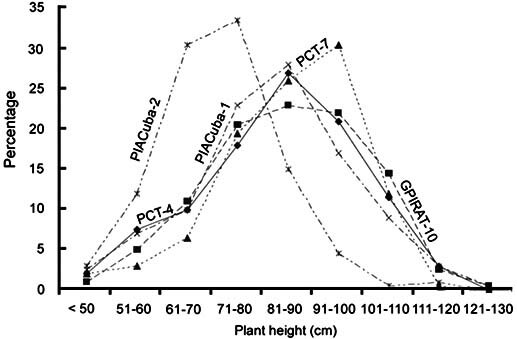 Distribution of frequencies for panicle length in introduced rice populations PCT-4, PCT-7 and GPIRAT-10, and locally created populations PIACuba-1 and PIACuba-2. 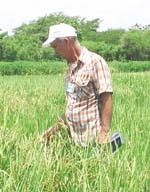 Evaluations were conducted at the Rice Experiment Station Sur del Jíbaro, Sancti Spíritus, Cuba, 2000. Figure 4. 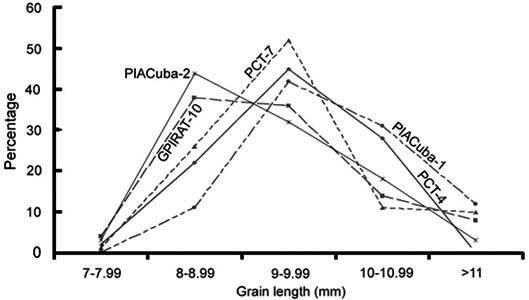 Distribution of frequencies for grain length in introduced rice populations PCT- 4, PCT-7 and GPIRAT-10, and locally created populations PIACuba-1 and PIACuba-2. Evaluations were conducted at the Rice Experiment Station Sur del Jíbaro, Sancti Spíritus, Cuba, 2000. Table 1. Percentages of rice plants resistant to either (1) neck blast or grain discoloration (GD), or (2) both diseases. Populations used were introduced (PCT-4, PCT-7 and GPIRAT-10) and those created (PIACuba-1 and PIACuba-2) by the Cuban rice genetic improvement programme at the Rice Experiment Station Sur del Jíbaro, Sancti Spíritus. For neck blast and grain discoloration, only the percentages of resistant plants were reported, as no special treatment was given to guarantee the presence of these diseases in the field, the reason being that values of more than 70% for resistance to neck blast were seen. For grain discoloration, pressure should have been heavier in that the highest percentage value for resistance was about 42% (Table 1). Population PIACuba-1 had the most lines that were resistant to both diseases. Given the current importance of these two diseases for Cuba, we need to consider a strategy of population improvement that will combine in the one population sources of resistance to both neck blast and grain discoloration. The use of a selection index, as described by Geraldi in Chapter 3, this volume, could be a solution to this problem. Results of the population characterization indicate that sufficiently wide genetic variability exists to conduct population improvement for the traits evaluated. According to Ceballos (1996), the success of this methodology depends on numerous factors, one of which, and perhaps the most obvious, is that sufficient genetic variability exists to permit progress in the desired direction. According to the above, we can guarantee that the basic understanding already established will ensure that rice population improvement in Cuba will have a high possibility of success. Practically, most of the Cuban experience so far has been to maintain populations and conserve genetic variability. A major concern in maintaining a population is to prevent any possibility of genetic drift caused by controllable environmental or genetic factors. For the genes from all plants of the population to be adequately mixed, they must all flower within the same period. To enable crossing between early and late-maturing plants, early maturing plants within chosen rows are cut above water level when they are about to begin booting, thus prolonging their flowering cycle. Borrero et al. (1997) suggested that to create or maintain populations, two or three planting dates must be used to guarantee the possibilities of exchange of genetic material between plants of different cycles. On beginning work in Cuba (1996-1999), only small experimental areas were planted. The idea was only to observe the variability of the materials before making any decision to incorporate the methodology as an additional alternative to the RGIPs overall strategy. However, care was always taken to ensure that the minimum number of plants as recommended by Geraldi and Souza (2000) was maintained. Starting in 2000, we decided to transplant a larger experimental area, where a minimum of 3000 plants from each population could be observed. Given the priority that the trait resistance to blast has for the RGIP, increasing emphasis has been given to it since 1998 in the improvement of introduced populations through recurrent, phenotypic, mass selection. Two cycles of recurrent selection have already been completed for populations PCT-4, PCT-7 and GPIRAT-10. Moreover, populations PIACuba-1 and PIACuba-2 are also being included because they possess the plant type that is the most suitable for the RGIPs requirements. Currently, work on population improvement is directed towards obtaining resistance to neck and leaf blasts, not only for these three populations (Pérez Polanco et al., 2000), but also for the two newer ones (PIACuba-1 and PIACuba-2). With GPIRAT-10, the focus is on improving tolerance of the lower temperatures in the Cuban winter. Population improvement for blast is carried out as mass selection for both sexes, according to the methodology described by Pérez Polanco et al. (2000). In the rainy season, a seedbed is planted with a given population and subjected to high disease pressure. From this seedbed, only those individuals that show resistance to the pathogen are selected. The selected plants are immediately transplanted to a larger area in such a way that the plants remain separated from each other. Thus, both the population (composed of healthy plants that do not present symptoms in leaves) and its male-sterile plants are pollinated by the populations own fertile plants. Later, to harvest the male-sterile plants, which had undergone recombination, only those plants that did not present symptoms of neck blast are selected. Harvest is done in bulk but only for resistant male-sterile plants. The harvested seeds are mixed to plant them as an improved population for a new recurrent selection cycle in the next cropping season, when recombination between resistant plants will take place. This process was repeated three times for population PCT-4, twice for PIACuba-1 and once for PIACuba-2, resulting in an improvement in the percentage of resistance in each population: PCT-4 with 40% of its plants resistant to blast, PIACuba-1 with 20% and PIACuba-2, with 15%. Moreover, in 2001, to give continuity to population improvement for blast, we used progeny of fertile plants selected during the improvement of different populations for line development. The progeny evaluated in 2000 was that which showed resistance in the disease beds and in the different generations of selection. Individual fertile plants were then selected from the progeny, and some seeds from each plant mixed. The mixture was planted to obtain an improved population after a recombination of the male-sterile plants. The remnant seeds from each individual plant were used to study the development of lines through the pedigree method. To continue with population improvement, the methodology described by Pérez Polanco et al. (2000) was followed. This strategy is now being adopted by the RGIP for rice grown during the Cuban winter (November to March), when minimum temperatures are around 15°C. Population improvement for tolerance of low temperatures involves phenotypic recurrent selection (panicle sterility as an indirect measure of susceptibility to cold). To do this, about 5000 seeds of fertile plants were taken at random from the population GPIRAT-10 and planted in November 2000 to guarantee flowering during the period with the highest incidence of low temperatures. Those fertile plants evaluated as being resistant were harvested, and their seeds mixed and planted in November 2001 to create a new population. The male-sterile plants were harvested to obtain the recombination. Moreover, 131 fertile plants of overall good phenotype were selected and planted as segregating lines in the same period to develop, through the pedigree method, cold-tolerant lines with other good agronomic traits. National programmes carrying out genetic improvement usually have as their main objective the development of new varieties, regardless of the method used to achieve it. Hence, when the method of population improvement through recurrent selection was used, evaluations and selections were made to take advantage of the genetic variability of the populations as sources for lines. Recombination served to generate a new and improved population. Hence, all variability generated is exploited and segregating lines obtained by the classic pedigree method. Management and selection criteria for lines derived from populations improved through recurrent selection are similar to those used in the classic method, from segregating lines to regional evaluations for yield and varietal development. The difference in managing lines originating from crosses versus those from populations is that, for the latter, the segregating lines with the male-sterility gene must be eliminated. This is done simply by harvesting, cycle after cycle of pedigree selection, only the fertile plants in the progenies evaluated, and eliminating those lines continuing to segregate for this trait. Table 2. Number of segregating lines originating from population improvement and advanced through the pedigree method, Cuban rice genetic improvement programme at the Rice Experiment Station Sur del Jíbaro, Sancti Spíritus. 1996-2001. Fertile plants are derived from the populations evaluated each year to obtain segregating lines by the pedigree method. Between 1996 and 1998, only 157 plants were derived from the populations. In 1999, this number dropped to 98 plants. Starting with plantings in 2000, we decided to exploit the populations more, choosing 439 plants, with another 487 in the following year. During the six plantings of these five populations, 1181 segregating lines were obtained (Table 2). The plants derived in each year were advanced individually by the pedigree method and each constituted a family formed by sibling plants. Each family was evaluated, and was eliminated if it presented undesirable characteristics such as poor plant type, presence of the male-sterility gene or symptoms of disease. Each selected family again underwent a new selection of plants, following the same selection criteria. This process of selection continued until homozygous lines were obtained. Through this process, we evaluated 130 lines in 1998, 235 in 1999, 165 in 2000, 584 in 2001, and 830 lines in 2002. In any one year, the lines constituted the sum of the lines derived from the population (S0 plants) and the selections from the previous year (Table 3). In 2002, at the Rice Experiment Station Sur del Jíbaro, 830 lines of different generations were planted, together with those for observational studies on yield, and one line for regional varietal trials. It should be emphasized that the evaluations for yield were carried out by planting trials throughout the country (Table 4). Table 3. Lines evaluated, derived and selected per year from all the Populations, Cuban rice genetic improvement programme, Rice Experiment Station Sur del Jíbaro, Sancti Spíritus, 1996-2002.
a. Data according to IRRIs standard scale (1988), where scores of 1-3 indicate resistance. To evaluate resistance to blast in each line, the standard evaluation scale suggested by IRRI (1988) was used. The evaluations shown in Table 5 indicate the percentages of resistant lines selected in 2001. For their assessment in 2002, reaction levels were grouped according to scores on the evaluation scale, where 1 to 4 is resistant and 5 to 9 is susceptible. In previous evaluations, the early generations, which still showed high segregation, had low percentages of resistant lines. In contrast, the S2 generation had percentages of resistant lines that were more than 70%, because of increased homozygosis and the various evaluations and selections made for this trait. Together with lines from population improvement through recurrent selection, 353 lines developed by the conventional improvement method were evaluated for their reaction to blast. These lines came from 20 crosses carried out by the RGIP, and were found in generations F4 and F6. However, none evaluated presented resistant reactions (scores between 1 and 4), all having scored between 5 and 9. This result shows, again, the importance of population improvement as a potent tool in genetic improvement. Table 5. Distribution (%) of rice lines selected in 2001 for evaluation in 2002, according to their levels of resistance to blast. a. On a scale of 1 to 9, where 1-3 indicate resistance, 4 indicates moderate susceptibility, and 5-9 indicate susceptibility (IRRI, 1988). Recurrent selection is a gradual but efficient way of accumulating different and complementary genes carrying resistance to blast (Correa-Victoria et al., 1997). Obtaining resistance to blast has been a major objective for several researchers using population improvement through recurrent selection, including Filippi and Prabhu (1996), Correa-Victoria et al. (1997), Courtois et al. (1997) Guimarães and Correa-Victoria (1997). Population improvement through recurrent selection constitutes a powerful tool for the genetic improvement of rice in Cuba. This conclusion rests on the following factors: the strategy requires few resources for application; work always involves populations; reliance on sources of variability without needing manual crosses to create them; a focus on directing variability through criteria and rigour towards traits of interest; and populations as sources of genotypes for selection for developing promising lines and future varieties. Continue to extract fertile plants to derive lines from the populations. Borrero, J.; Ospina, Y.; Guimarães, E.P. & Châtel, M. 1997. Ampliación de la base genética de los acervos del arroz, mediante la introducción de variabilidad. In E.P. Guimarães, ed. Selección recurrente en arroz, pp. 55-66. Cali, Colombia, CIAT. Ceballos, H. 1996. Variabilidad genética en arroz, curso de selección recurrente. Cali, Colombia, CIAT. 30 pp. Correa-Victoria F.J.; Guimarães, E.P. & Martínez, C.P. 1997. Caracterización de la estructura genética y la virulencia de la Pyricularia grisea Sacc. para desarrollar variedades resistentes al añublo del arroz. In E.P. Guimarães, ed. Selección recurrente en arroz, pp. 203-215. Cali, Colombia, CIAT. Courtois, B.; Nelson, R. & Roumen, E. 1997. Creación de un acervo genético para mejorar la resistencia parcial a la Piricularia en el arroz de secano, mediante selección recurrente. In E.P. Guimarães, ed. Selección recurrente en arroz, pp. 189-202. Cali, Colombia, CIAT. Filippi, M.C. & Prabhu, A.S. 1996. Selección recurrente para la resistencia parcial a Pyricularia grisea Sacc. In Arroz en Brasil, curso de selección recurrente en arroz, pp. 177-188. Cali, Colombia, CIAT. Geraldi, I.O. & Souza, Jr, C.L. de. 2000. Muestreo genético para programas de mejoramiento poblacional. In E.P. Guimarães, ed. Avances en el mejoramiento poblacional en arroz, pp. 9-20. Santo Antônio de Goiás, Brazil, Embrapa Arroz e Feijão. Hanson, W.D. 1959. The breakup of initial linkage blocks under selection mating systems. Genetics, 44: 857-868. IRRI (International Rice Research Institute). 1988. Standard evaluation system for rice. 3rd ed. Los Baños, Philippines, 54 pp. Pérez Polanco, R., Châtel, M. & Guimarães, E.P. 2000. Mejoramiento poblacional del arroz en Cuba: situación actual y perspectivas. In E.P. Guimarães, ed. Avances en el mejoramiento poblacional en arroz, pp. 131-144. Santo Antônio de Goiás, Brazil, Embrapa Arroz e Feijão.